Barking Mad Animal Rescue became official December 2014 and received it's 501(c)(3) status. I never dreamed that it would grow this fast...but there was such a need! Anyone familiar with rural, underpopulated areas with zero animal shelters? The struggle became real and it happened fast. BMAR is directly & indirectly responsible for over 300 animals each month...full capacity! And yet even more are in need! Our local approved adopters are very few...as in zero. So we transport out of state by transferring to our sister rescues which have a high adoption rate. Approved Adopters. Home checks. Volunteers making better lives for companion animals. The problem? Transport is a huge financial drain on our meager resources. Ranging anywhere from $175 per dog to an average $350 per dog or cat and can go higher! The math is staggering for transport fees! 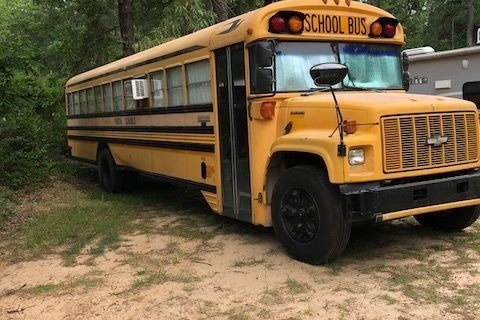 To combat this...we bought a bus. It's ours. It's paid for. But the project is just starting. We are having it completely serviced and inspected. We need to outfit it with impact resistant crates. One of our paid transport vans was rear ended and dogs were lost. We learned from that. Accidents happen but impact resistant crates would/could save lives. Expensive? Yes...but long lasting and life saving. We have a 40' bus with live in quarters that will haul 40 dogs to a better life! A human will always be inside with those rescued babies seeing to their welfare and comfort. And we need a vehicle wrap! We want the world to be involved in our rescue efforts and to know that we are there to help! Pssssst...it's cheaper than a paint job! Does this sound like a fairy tale for Barking Mad? You bet! But we are not stopping there! We are reaching out to other rescues, other shelters, if we have empty crates heading out...we will move their dogs too! The entire project will have a total cost of $65,000. We have scrimped and saved, begged and borrowed and we are short $25,000 to make transport a reality. We have the bus, the drivers, the dogs. We need to finish it. While it seems like a lot of money...it's not. I priced a too small cargo van @ $38,000+ without the wrap, crates or the space to do what we wanted. Some of our trips are 5000+ miles...we want those dogs safe, contained, and with a competent handler at all times. So the bus is our choice. We hope it is yours as well. We hope you see the value in our rescue work. We hope you want to save dogs to. Please look into your hearts. Please donate. We take the dogs & cats that nobody wants and we make sure they get to the right place, their forever homes!